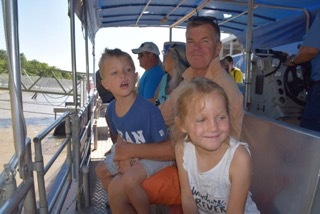 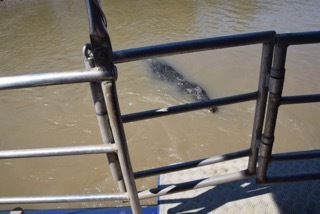 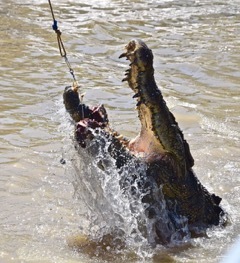 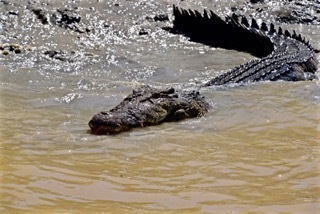 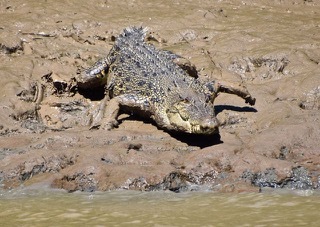 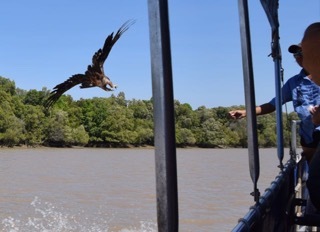 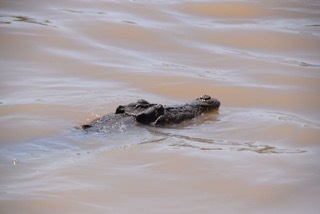 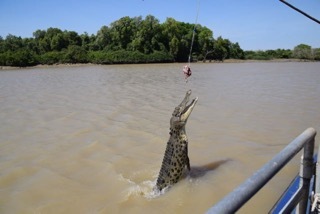 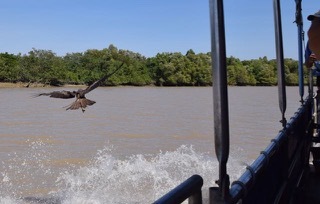 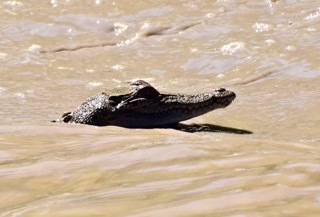 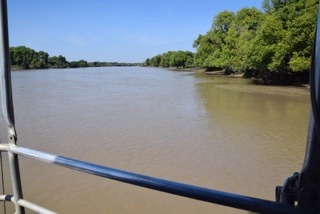 Today the World ARC organised a morning tour on Adelaide River : The Jumping Crocodile Tour. 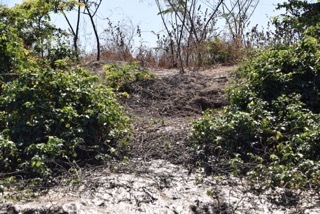 Before we got any close to the big reptiles we got first acquainted to ones from the bushes: the snake. 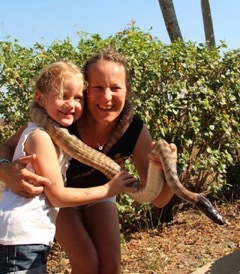 A very courageous Inez dared to have her picture taken with Mummy and the snake! 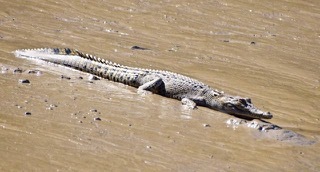 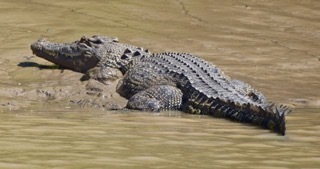 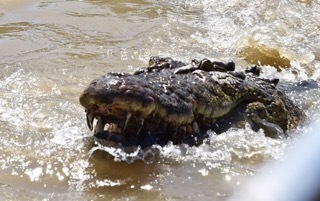 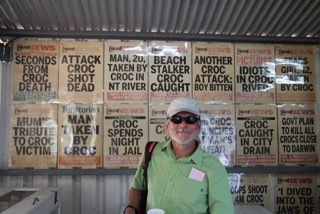 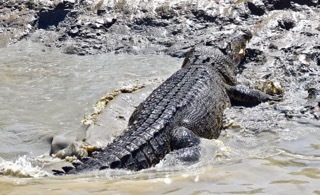 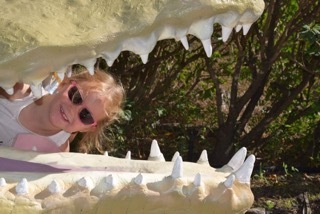 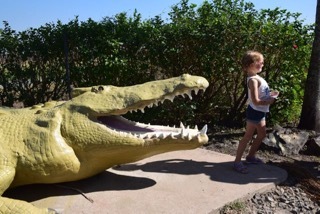 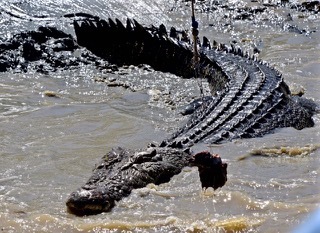 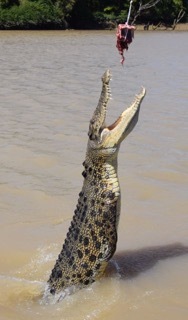 The saltwater crocodiles (salties) are the most dangerous animals in the north of Australia. 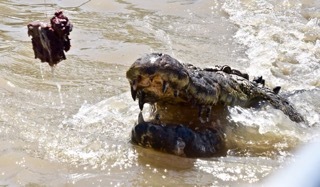 Attacks are rare, but usually fatal. 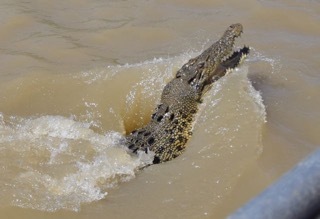 There are a lot of salties in the Darwin area, and sea bathing should be avoided. 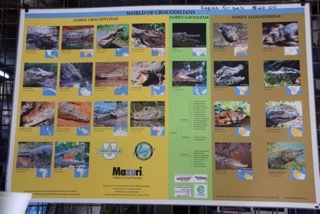 These are the different crocodile species found in Australia. 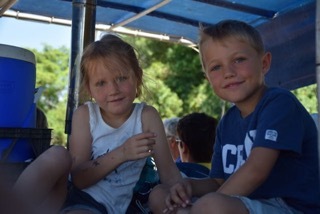 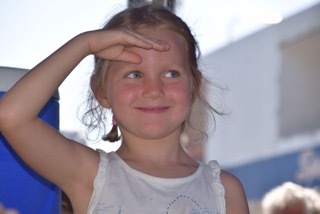 We found our places on the boat and Alex and Inez got the best and safest (!) 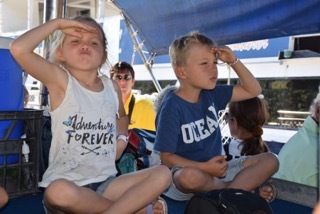 spot on the boat. 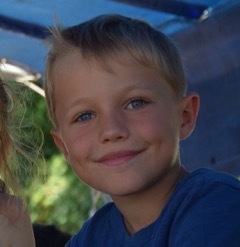 Right in the middle and above everyone else. 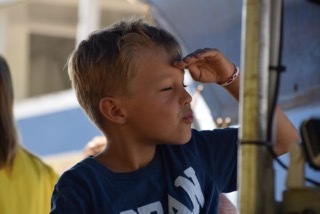 Off now searching for some “salties”. 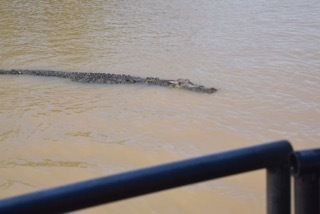 Our guide told us strictly to sit in our seats and especially NOT to lean over…. 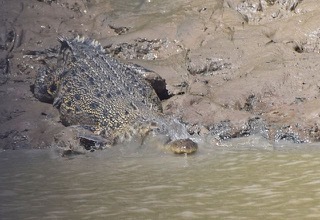 While most crocodilians are social animals sharing basking spots and food, saltwater crocodiles are more territorial and are less tolerant of their own kind; adult males will share territory with females, but drive off rival males. 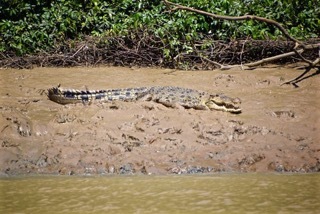 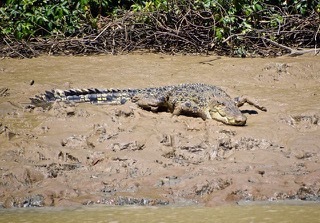 Saltwater crocodiles mate in the wet season, laying eggs in a nest consisting of a mound of mud and vegetation. 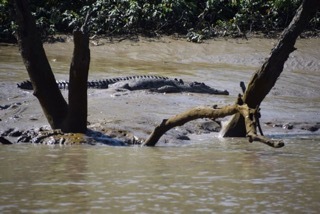 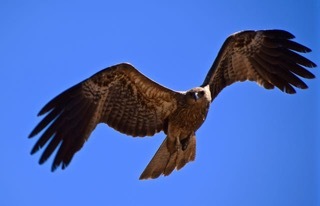 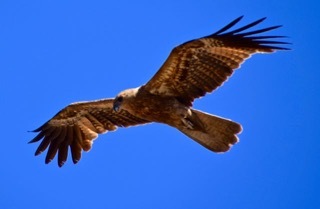 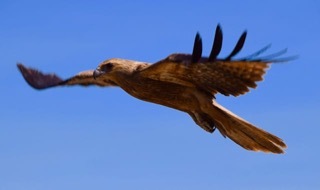 The female guards the nest and hatchlings from predators. 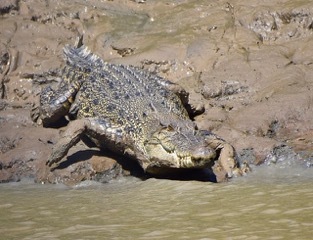 The crocodiles have their special territory all along the Adelaide River as we cross it and all the crocodiles we saw are named as well as their girlfriends. 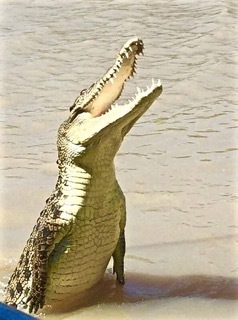 When above water, crocodiles have an ability to detect whatever is behind them thanks to a spine they have on their neck feeling vibration. 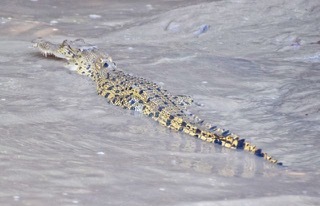 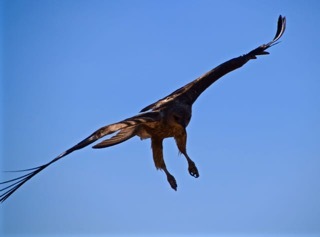 Any prey is liable to be caught and the crocodile is seldom missing its hunt. 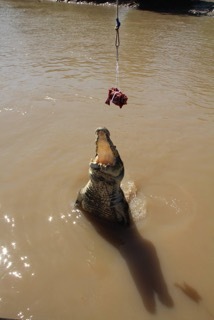 Feeding time. 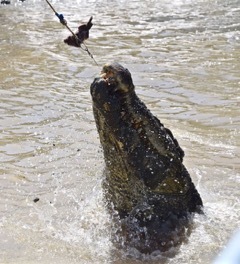 No it is not natural to feed this wild animals, however it was amazing to see this nearly invisible animal in the water jump in a millisecond to catch his prey. 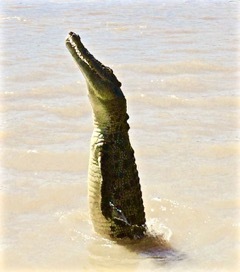 It is only by his very strong tail that he can “stand” out of the water like here below. 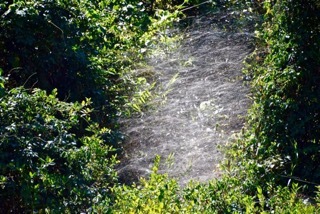 A crocodile’s nest and a huge spider web! 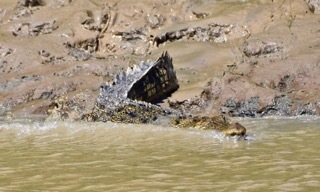 A crocodile making his way down to the water.